With a team of more than 40 expert gynecologists, Thumbay Group’s hospitals are among the best providers of maternity care in the region. 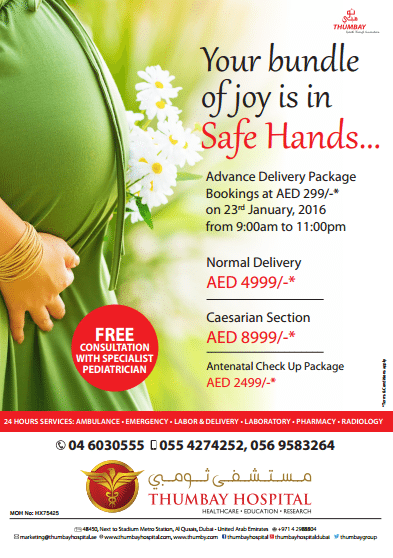 Thumbay Hospital, the leading academic hospital in Dubai owned by Thumbay Group, has announced a special ‘Book Now, Deliver Later’ maternity package for pregnant women. Under this scheme, normal deliveries will cost as low as AED.4999, and caesarian sections, just AED.8999. A special ante-natal package is also available, at AED. 2499. Those desirous of booking the packages can do so by paying a booking charge of AED.299 at a special camp which will be held from 9 am to 11 pm on Saturday, 23rdJanuary 2016, at the hospital premises next to Stadium Metro Station in Al Qusais, Dubai. The camp will also offer free consultation with specialist pediatrician. Mr. Akbar Moideen Thumbay, Vice President of the Healthcare Division of Thumbay Group said that all those who registered at the camp on the designated day would be able to avail the discounted package, irrespective of their stage of pregnancy. With a team of more than 40 expert gynecologists, Thumbay Group’s hospitals are among the best providers of maternity care in the region. Thumbay Hospitals also offer antenatal packages, painless delivery services, executive labor and delivery suite (private), state-of-the-art equipment, 24-hours emergency and in-patient services, ultra-modern neonatal care units etc. Thumbay Group’s hospitals at Dubai, Ajman, Sharjah and Fujairah are managed by highly qualified professionals from 20 nationalities, speaking more than 50 languages, treating patients from more than 175 nationalities. With world-class hospitals, affordable family clinics, labs and pharmacies spread across various locations in the UAE, Thumbay Group’s healthcare network has emerged as one of the largest in the region. For more information on the ‘Book Now, Deliver Later’ camp, please contact 04-6030555 or 056-9583264.